Chef Jose Garces rose to the top as he became the Next Iron Chef. In 2008 he defeated Bobby Flay as a competitor in Iron Chef. The secret recipe for the final competition was racks and ribs. Garces created buffalo rib steak au poivre; Mexican-style braised carnitas taco; Pork loin with herbs; Spanish pizza with beef short ribs; and Baby back ribs with spicy BBQ sauce. With a menu like that, it's easy to understand why he won. He promises to include his Latin style of cooking and flavors to the Iron Chef competitions where he will be featured. This is a big day in the world of Latin Cuisine. 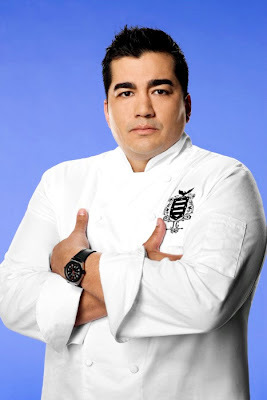 Chef Garces, we congratulate you. They say you are what you eat and the Yankees are eating delicious home style comfort Latin foods thanks to Chef Ricardo Cardona who has taken on the role of the Yankees' head chef. 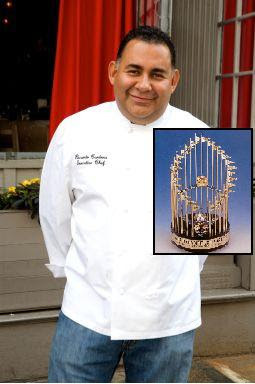 So if you truly are what you eat, The World Series trophy belongs to Ricardo Cardona. This is assuming the Yankees win. Zagat Buzz interviews Chef Ricardo Cardona and reveals some interesting food habits of the Bronx Bombers. Learn how he became the chef of the Yankees and what they love to eat. Read the interview.